I've been making a diligent effort to stay more in touch with pop culture for possible makeup tutorials. I've gotten a couple of requests to do Ciara. I was watching 106 & Park and saw her new video Never Ever with Jeezy. I liked the softness in her look, particularly the lip color! I just got a pink combo from the MAC Creamsheen Collection similar to this so I definitely wanted to rock it in a tutorial. 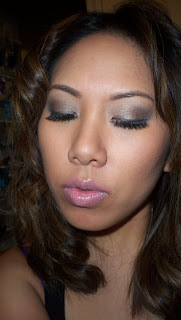 Luckily I was able to dupe her eyeshadow combination. I even curled my hair for y'all! 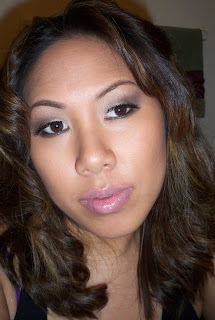 The key to this look is a matte face, soft brownish gray smokey eyes, and pink lips. It's actually a really simple look. great look! it def reminds me of Ciara. Love the pink lips! hello ren ren. im ur biggest fan at youtube and ABB. i ve learned lot of make up from YOU!!! and u always look FAB!!! Love this look! I always like your looks that are wearable in the day time too. Great job! :) You do such a great job with these looks! Very Pretty Ren! The light lips are my favorite part! Also, check out my contest if you get a chance! you're so pretty!..i love how it's very soft and natural!..i like the hair too..you definitely pull it off! sheet masks are easier as there's no goo to wash off! w00t! ardell wispies you say? really? oh wow!! u almost look like her tooo.. just BEAUTIFUL!!!!! i love this new series!!! great look! !